I'm still way down in the collar/blouse drafting rabbit hole, and this time it's a convertible collar. I drafted this collar in my pattern drafting class, and I had to do a bit of hunting around the sewing room to find the pattern piece! My skirt is this old favourite, and this blouse is a variation on the black blouse from a few weeks' ago. I like the little shoulder yoke and the gathering, so kept them. I wanted to try cutting the back and yoke in one piece by overlapping the pattern pieces at the shoulder seam, but completely forgot about it until after I'd cut it out! Maybe next time. The sleeves are based on the sleeves from the Deer and Doe Airelle blouse, which I have made here and here. I always felt the Airelle sleeves were a bit too short; so, using my sleeve block, I lengthed them by 1 inch, and also made them a bit narrower - I can't remember by how much, maybe an inch. And they turned out exactly how they looked in my head, which is always pleasing. The fabric is some peachskin fabric that was left over from the lining of my Woodland Stroll Cape. The only thing I don't like about this blouse is the facing - which is fine, because it's in the inside, and nobody can see it. But I've been pondering neckline facings lately because the one's that I've drafted never seem to sit flat. This isn't a problem, because it can't be seen from the outside, but it was getting on my nerves. Then I had one of those moments when a solution came to me when I wasn't even thinking about it; in fact, I think I was shampooing my hair at the time! You can see in this photo how the facing flips up towards the shoulder seams. The solution was to overlap the shoulder seam a bit in the same way that you would when drafting a Peter Pan collar, because a facing is basically a flat (Peter Pan) collar, but on the inside of the garment. So that's what I did; and it worked! 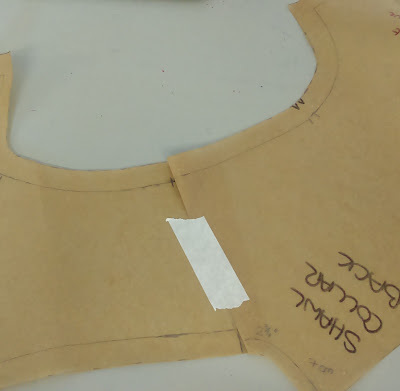 I overlapped the shoulder by 2 cm, as in the instructions for a Peter Pan collar in my drafting book "Metric Pattern Cutting For Women's Wear", then traced the facing from the neck edge in. I made my facings 3 inches wide, which allows for the seam allowance and also finishing the outside edge. I also made the facing as two mirror image pieces with a seam at the centre back, instead of a back facing and two front facings joined at the shoulder. It just made more sense to me to do it this way, and it reduces bulk at the shoulders on a thicker fabric. I tried it out on another blouse, and was delighted with the results. This blouse deserves a post of it's own because it also has a skirt that goes with it, but here is how the facings look in comparison to the red blouse's facings. Much nicer! I appreciate that I'm getting into Drafting Anorak realms, but I wanted to document it in case it helps someone else. Anyway, I hope everybody is enjoying your Easter break whatever you are doing. I intend to spend most of my crafting. Here in Northern Ireland we get Easter Monday and Tuesday off work (I've no idea why! ), so I have four days of sewing and munching easter eggs ahead of me. Not bad! This is amazing! I love the blouse but the facing tip is gold! I can't wait to try it out. I've never really understood why you need to overlap when drafting a Peter pan collar, you don't happen to know why, do you? Thank you! Glad to be of help! I'm afraid I don't know why Peter Pan collars are drafted that way. Maybe they wibbled out like my facing, and a bright spark tried overlapping the shoulders?? What I want to know is why it goes wibbly when the fabric is exactly the same size as the front and back bodice. There has to be scientific reason, I may have to google it!! 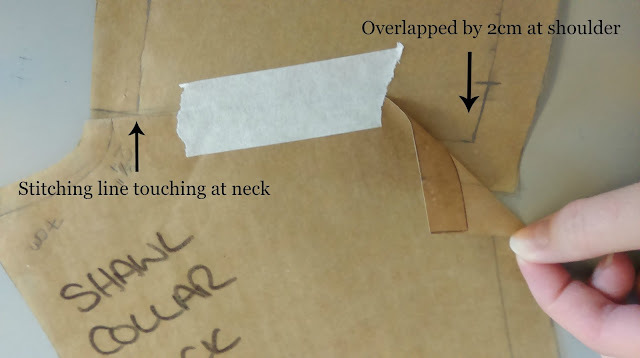 I learnt a lot from this blog post - obviously the brilliant tip about the facings, but also what a convertible collar is....I'm afraid I hadn't a clue and had to go look it up! I'm guessing its because I haven't really delved into the world of collars yet. Anyway, your blouse is really gorgeous, especially the gathers at the yolk, and it looks lovely tucked into your skirt. 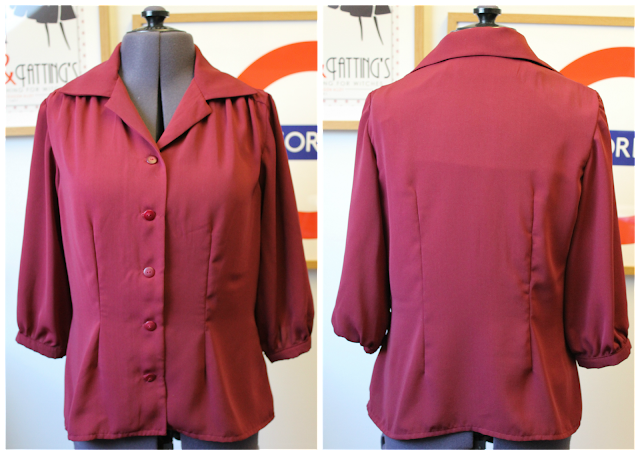 Looking forward to seeing your next blouse - those facings are perfect!!! Thank you! I wanted to describe what a convertible collar was, but couldn't find the right words. I think it might also be known as a camp collar, because that's what it's called on the Craftsy Collars and Closures drafing class. Thank you! That wibbly, wobbly facing was doing my head in, and I do like a challenge! i LOVE this idea! I'm trying it on the next blouse I make. How smart of you to re-imagine the construction this way! And those are two gorgeous blouses, by the way. What pretty, rich colors! Thank you! I was originally going to make two fronts and one back facing, but then I couldn't decide where the join should go. So then it sort of made sense to do the facing in two pieces. Good luck with your blouse! Genius! I've suffered the wibbly neck facing trauma also. Thanks so much for posting your clever solution. I have that book too - I've draughted the skirt block and successfully made pencil and a-line skirts with it. Now I just need to give the bodice block a go! Thank you! I'm so glad somebody else has experience this, because I thought I was doing something wrong in my drafting. Good luck with your bodice block. Of course - what a lightbulb moment! A facing is a flat collar just on the inside. Thanks Lynne. Thank you! Myy brain even amazes me sometimes! Thank you! Yes, I can see how it would work with the Vintage Shirt Dress. That is such a lovely pattern. You're really on a roll with all these collars and blouses! This one looks lovely and really suits you. I bet you were so pleased to solve the facing problem too! Thank you! It was so easy when the idea came to me. Now I have to remember to change it on my other drafted patterns. It looks super, I really like the look of the Peter Pan collar. I have been in awe looking at your photos on Instagram and am looking forward to reading more about your latest project soon! Thank you! I really am a bit obsessed with collars at the minute. I'm hoping to get a bit of the coat done at the weekend, but I've stalled a bit with the lining.